Low volume audio files can be close to useless and also very frustrating, especially if you can’t rerecord the original audio. Whether it be an MP3 song that you are trying to listen to on your laptop or a recorded audio file that isn’t quite loud enough, increasing the volume on nearly any audio file can easily be done using desktop or online audio editing software. In this article, I’m going to talk about a couple of methods you can utilize to fix the sound levels for an audio file. If you’re only needing to do this for a single audio file, the best choice would be an online tool. If you need more control and options or have to adjust the volume on many files, the desktop audio editing program will probably be a better choice. Luckily, there are some sites on the Internet created solely for the purpose of increasing the volume of your audio file. Here are the ones I have used and that work well. 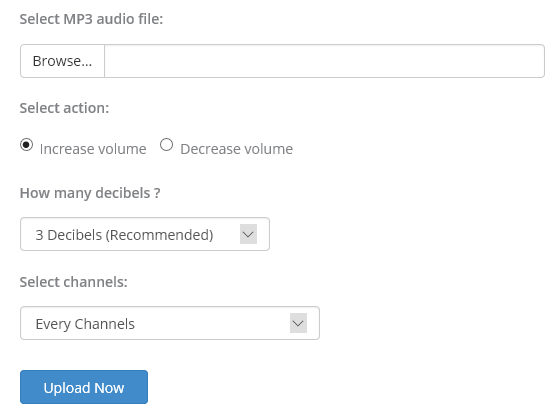 MP3 Louder makes it really easy to increase the volume of your audio file. Click Browse to select the file you want to adjust and then choose the Increase volume radio button. You can also use this site to decrease the volume of an audio file. By default, the audio will be increased by three decibels, which is recommended. Obviously, you can play around with this setting, which goes all the way up to 50 decibels. In addition, you can select whether to increase every channel or just the left or right channel. Click the Upload Now button and wait a few minutes while the file is uploaded and optimized. After it is complete, you should see a green download button. That’s about it! It’s really easy to use and completely free as of now. I’m sure there is some restriction on the size of the audio file, but it should work just fine in 99% of the cases. Another free online tool is Grab Tube. Just select your file and then choose from either automatic normalization or manual. If you choose manual, you basically have three options, which are presented as the word loud in bigger and bigger text. The maximum size for the MP3 file is 40MB, so that should easily be large enough for most people. If you do have a larger MP3 file, you can always cut the MP3 file first into smaller pieces and then use this tool. You can download the audio file directly by clicking on the link or you can listen to the new audio file online. This is convenient in case the first adjustment wasn’t loud enough and you have to try a higher setting. On the desktop, my favorite tool for editing any kind of audio is Audacity. I’ve already written several articles about Audacity including how to convert cassette tapes to digital format and how to capture audio from your PC. Using Audacity, it’s really easy to increase the volume of your audio file also. 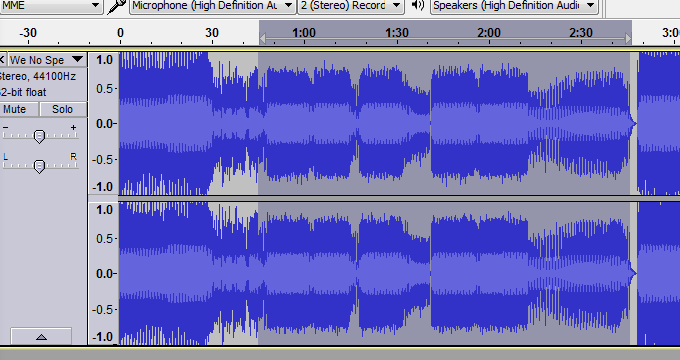 Another advantage to using a tool like Audacity is that you can increase the volume of just a part of the track, rather than the whole thing. The online tools will amplify everything, which might result in certain parts being too loud and therefore being clipped. Open Audacity and load up audio file into the program. If you want to amplify the whole track, do not select anything. If you need to amplify just a part of the track, go ahead and select that portion by clicking and dragging your mouse over the blue area. Now click on Effect at the top and then click on Amplify in the list of effects. 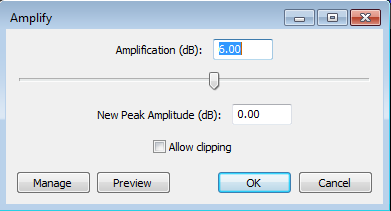 Here you can adjust the slider to choose the amount of amplification in decibels. Note that if the sound will be clipped because it’s too loud, the OK button will become grayed out unless you check the Allow clipping box. If you want to amplify the audio file in Audacity without any audio clipping, you need to either select only the portion that is low or you need to use an audio compressor first. An audio compressor will reduce the difference between the lowest and highest (loudest) points on a track. Audacity, of course, has compressor functionality built into it too. Just click on Effect and choose Compressor. You can read here about how compressor in Audacity works. Once you have done that, you can try to amplify the audio again. Also, try to allow clipping once and see what it sounds like. Sometimes even with the clipping, the audio will sound acceptable. Overall, adjusting the volume on an audio track is an easy task, but getting the correct result can be a bit trickier. Always remember to keep your original audio file, so that you can easily go back to it in case the adjustments aren’t to your liking. If you have any questions, post a comment. Enjoy!